Anything DreamSNES-related can be asked in this forum, such as general questions about the emulator, how to burn it, etc. First thing first. Download and install BootDreams and Alcohol 120%. Now download DreamSNES 0.9.8 plain files and extract it (desktop would be the easiest). Now that the downloads and extracting is complete, we move onto setting up the folder for image creation. Open the folder that DreamSNES 0.9.8 plain files was just extracted to. Place the IP.BIN into the cd directory. Next, put all unzipped ROMs in the roms directory. OPTIONAL: For the ROM list to load quicker (by not reading each ROMs header for the game's title) you can use a ROM list creator. ROMS.LST Maker v1.2 by kRYPT_ is recommended. OPTIONAL: If you don't want DreamSNES to scan a certain directory you can stick a file named NO_ROMS.HERE in it. This will prevent DreamSNES from scanning it for ROMs. OPTIONAL: A extra feature DreamSNES has is playing MP3s. By default there is 1 MP3 in the sounds directory. If you wish, you can place any extra MP3s there. Make sure at least 1 MP3 is present in this directory before image creation. 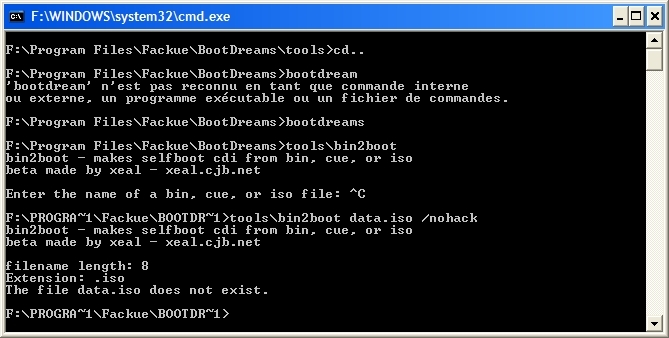 Now that your directory is setup, open BootDreams (BootDreams.exe). You can create a DiscJuggler image, a Nero image, or you can burn it straight to CD. I recommend burning it straight to CD. If you decide to create a Nero image, TAO is the recommended image type (DAO is required for Nero 5.x). Once you have clicked the task's icon, browse to the cd directory you placed the IP.BIN in earlier. Now click Process (if you're burning DreamSNES within BootDreams, add a blank CD-R before continuing). The disc should begin to burn or the image should begin it's creation. If you created a image, you need to burn it. That's it. Test it in your Dreamcast and play away! Last edited by emptythought on Tue Apr 01, 2008 4:31 pm, edited 13 times in total. Perhaps there needs to be a list stickied at the top of this forum detailing how to get a solfbooting or nonselfbooting dreamsnes to work on the dreamcast. okay so what if you do get an error saying apply.zvr file was missing? Are you sure that you are selecting the cd folder when you're browsing to select a folder to create a selfbooting image of? Reason I'm asking is because "gfx\APPLY.ZVR" is the first item in the BDS file, so I assume that for some reason you are selecting the incorrect folder. Basically BootDreams reads the entire BDS image (it contains a list of file names) and checks if each listed file in the BDS image is actually in the folder you selected earlier. I probably was I really am just trying things to get it to work okay so now im selecting the CD folder in dreamsnes when i click burn to blank media its saying I need to install an aspi driver what should i do? also what do I do with alcohol 120%? im using cd record, by the way thanks for the help. Once you install an ASPI driver, you won't have any problems. But, if you use CDRecord, you do not need to use Alcohol 120% to burn the image since the disc will be burnt already. I suggest create a image (DiscJuggler or Nero), and then burn the created image with Alcohol 120% so you do not have to mess with installing an ASPI driver (although if you do install it, I would recommend CDRecord over creating an image). when bootdreams gets done making the image bin2boot starts then gets a runtime error 53 whats that? ...also where does bootdreams put the image file? It shouldn't be giving that error, at all. What's the location of the folder you're trying to selfboot? Did you install BootDreams to the default folder (C:\BootDreams)? What drive is it installed at, and what drive is the folder in? Are you using the latest version of BootDreams (0.3)? Are you trying to make a DiscJuggler or Nero image? If it's a Nero image, is it a TAO or DAO image? What OS are you using? Do you have any of the options checked in BootDreams' Options menus besides Use a BDS image? I really can't think of anything besides the fact that you are using SP2 does stand out to me. A lot of people do have problems for one reason or another when trying to get a working Dreamcast disc on WindowsXP SP2. I'm not exactly sure if this will work, but it's possible that it will fix it. Now save it in C:\WINDOWS\SYSTEM32 as AUTOEXEC.NT. If it ask to replace it, choose yes. You should restart then try again. Edit : I have WIN XP SP2 PRO. But for him, it doesn't for whatever reason. I'm not sure why either. May be he has Cygwin installed. Or another bin2boot is in his computer. I have Cygwin installed, and that doesn't cause me any problems. I also have a few bin2boot.exe's on my computer, doesn't cause any problems either. Can this work for other emulators/homebrew games as well?